This is the story of what was learned by the Leadership Conference of Women Religious during a six-year crisis (2009-2015). A high-ranking and very powerful Vatican office suddenly and very publicly confronted the organization with forceful questions and negative assumptions about the foundation of the lives of Catholic sisters. The conflict grew more intense midway through those years. The Vatican office threatened the autonomy and even the existence of the conference, an organization on which the great majority of US Catholic sisters rely for many kinds of resources, supports, and connections. The experience rocked LCWR's officers, its hundreds of members, and the approximately 60,000 sisters who belonged to member congregations at that time. Yet the ultimate resolution benefitted everyone. How did that happen? This book answers that question. It not only explains how the organization worked through a very difficult situation, but it provides spiritual grounding, useful information, as well as inspiration and hope to anyone working through a situation of conflict, polarization, or even impasse in their own personal, professional, family, community, neighborhood, or organizational settings. During the six-year period of investigation by the Vatican's Congregation for the Doctrine of the Faith and since that time, LCWR was asked by many to tell the story of how the organization and how its leaders navigated this time of tremendous obvious risk as well as less visible personal pain and, ultimately, blessing. Reporters have wanted the organization to offer an exposé of the unrevealed details of what provoked this investigation and of "who said what when" in the very slow process of its resolution. This is not that tell-all book. 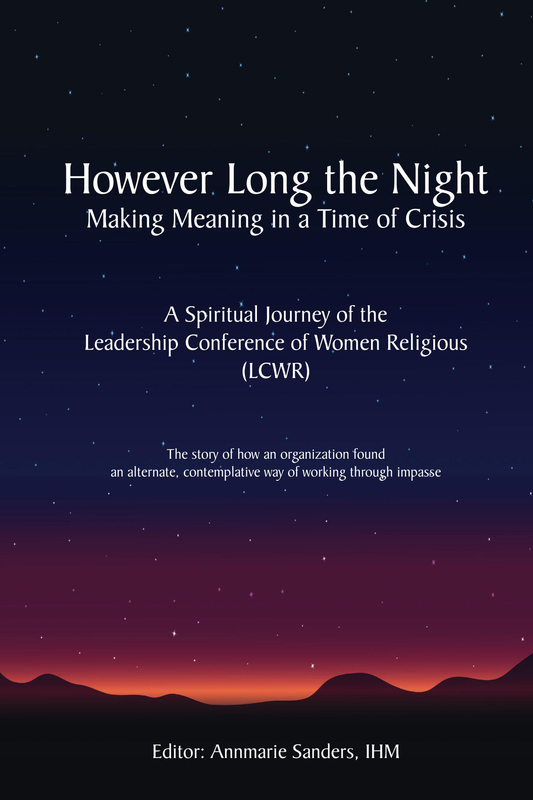 This is a serious effort to describe what LCWR's leaders learned personally and as an organization about how to weather a crisis in ways that create a new and better reality. This book is the product of reflection over time. The authors had long pondered if there was any benefit to their telling LCWR's story and their own stories to the public. Their reticence was palpable primarily because it had been such a sacred journey for them and they wanted it to be respected as such. Conscious of the dire national and international conflict existent today, the authors chose to risk telling their story with the hope that it could offer a way forward for others. Readers will see how these women handled the challenges that confront any leaders in crises - what goals to pursue, what overall strategies to use, when to share or withhold information within the organization and with the public, how to find or create a solution. They will also see how they called on rich spiritual and cultural traditions. The formal methods, processes, and practices used are readily translatable for use in other communities and organizations. These learnings are practical options that may help others to create new and better realities in their own parts of the world. Marcia Allen, CSJ; Florence Deacon, OSF; Pat Farrell, OSF; Sharon Holland, IHM; Mary Hughes, OP; Janet Mock, CSJ; Annmarie Sanders, IHM; Joan Marie Steadman, CSC; Marlene Weisenbeck, FSPA; Carol Zinn, SSJ. The authors are available to speak at workshops and other events. For information contact Annmarie Sanders, IHM at asanders@lcwr.org. To have begun this book with pre-emptive “righteous indignation” (at “the opposition”), and finished contrite and deeply enlightened, represents the beginning of a much-needed conversion in this reader. Articulating the assumptions of a confrontational culture cannot be authentic Christianity; and this book shows what is needed when personal bias appears so Godly and other people so wrong-headed. The story of LCWR’s journey through the doctrinal assessment is one of astonishing integrity and compassion. Learning how women religious moved through this most public and personally painful experience is a masterclass in spiritual maturity and organizational strategy. For Millennial readers such as myself, to learn that crisis-management meetings started with 45 minutes of silence, for example, is a practical call to a different way of being in leadership. Now that our country is deeply polarized and perplexed as to how to heal, However Long the Night teaches us how to lead with integrity, stand together in trust, and forever center the vision of a world transformed -- even when our hearts are breaking. I have no hesitation in stating that this is the best leadership book I have yet to read on how to lead through a crisis-laden time and emerge with one’s integrity, community, capacity, and faith stronger for the experience. Frequently now, leaders must navigate through conflicts with those who would overwhelm them and take away their power. These situations challenge leaders to their very core; the usual response is to meet aggression with aggression and thus only increase the conflict and dysfunction. Here is a guidebook of consciously earned wisdom for how to walk through such dark struggles and not lose our way. Through the long years of discord with those in the Vatican, the sisters maintained their purpose, sanity, and faith, and created a stronger, more cohesive community of sisters across America and beyond. This treacherous path was continually illuminated by their deepening faith and their skilled processes for collective discernment. They responded thoughtfully and patiently as a community of the faithful discovering ever deeper meaning and solidarity from their trials.